Glyphosate. Not keeping me up at night. Now, that presumably sounds extremely detailed and impressive if you don’t know any toxicology. What you wouldn’t know from reading through all of it is that their reference 121 actually tested glyphosate against human CYP enzymes. In fact, you wouldn’t know that anyone has ever actually done such an experiment, because all the evidence adduced in the paper is indirect – this species does that, so humans might do this, and this might be that, because this other thing over here has been shown that it could be something else. But the direct evidence is available, and is not cited – in fact, it’s explicitly ignored. Reference 121 showed that glyphosate was inactive against all human CYP isoforms except 2C9, where it had in IC50 of 3.7 micromolar. You would also not know from this new paper that there is no way that ingested glyphosate could possibly reachlevels in humans to inhibit CYP2C9 at that potency. In the pharma lab, if a compound had an IC50 of 3.7 micromolar against a target, we’d have to be desperate to call it a “hit”. That level of activity means you’d have to choke down a lot of chocolate cookies before you’d be even mildly affected. So, you can stop worrying about glyphosate poisoning. That doesn’t mean everything in the world is safe to consume. It’s just that glyphosate is no dioxin and you won’t have to superfund site a farm that uses it. Lowe also has a post on the cost of cancer drugs that is worth reading. It gems fairly nicely with my cynical theory of the current pharma business model, which goes like this: Once upon a time, big pharma made drugs for all kinds of ailments, like heart disease, schizophrenia, depression, reproductive health, antibiotics, diabetes, pain, inflammation, etc. But over the last 30 years, it has become increasingly more difficult to get those drugs to market for a variety of reasons I won’t go into here. Suffice it to say that the FDA doesn’t approve very many small molecule drugs anymore. Like virtually none. A pharma can spend a lot of money on research only to have a drug shot down at the approval stage. So, how does a drug company make money if it can’t sell drugs? Easy. It concentrates on cancer and orphan drugs. Orphan drugs are for diseases that are relatively rare. For cancer drugs, the path to profit is pretty straightforward. The patients are desperate. They’ll pay what the market will bear and then some. Will they mortgage their houses? Yeah, probably. So, the market is there. But it gets better. Cancer drugs are fast tracked for approval and no one is overly concerned with toxicity. In other words, there won’t be class action lawsuits because patients are grateful for any extension of life they get. Even if the patient dies, their families are likely to consider their treatment as advancing the knowledge of science. No one complains. If you’re a bean counter, oncology drugs are as good as it gets. They’re profitable, quickly approved, they don’t have to be perfect and no one will hold you accountable. It’s probably the same situation for orphan drugs. This is the financier’s mindset at work. R&D people don’t think like this. But in the end, there is a ceiling to the amount of money we as a society are willing to pay for potentially lifesaving drugs and we are now up against it. Meanwhile, if you are suffering from any other ailment, like bipolar disease or osteoporosis or some flesh eating bacterial infection, you’re going to be stuck with older drugs that are quickly becoming generics. The good news is that the generics will be cheaper, well, at least for a little while longer. I don’t think that can last as there won’t be enough profit in generics to keep the production facilities up to FDA standards. I can easily imagine some production facilities being taken offline a la the rolling blackouts of the California energy crisis 10 years ago. Some jerk generics traders are going to be yucking it up about Granny not being able to afford her cholesterol lowering drugs. Call me paranoid but as far as I know, there’s nothing to stop such scenarios from taking place and I wouldn’t be surprised if it’s already happened. At some point, the price of generics will start to rise and in some cases, they haven’t really dropped all that much yet. There won’t be a steady stream of new and improved drugs coming from the pipeline. It will be more of a thin trickle. The public has spoken. It doesn’t want me-too drugs even if they are better than what’s already on the market, and it doesn’t want any drug that’s less than 100% perfect and free from all side effects. Whether this combination of financier morality and public skittishness is good for medicine, science or society are questions we haven’t even considered yet. No one, it seems, except the displaced scientists from Pharmageddon seem to be discussing those issues. Someday, the Ezra Kleins and Duncan Blacks will wonder how that happened but it’s already almost too late to do anything about the coming Dark Ages of pharmaceutical medicine. So, if you’re rich and you have cancer, you’re probably going to be Ok. If not, well, it’s just another symptom of being in the 99%. This weekend I bought a lawnmower and cut the grass. It turns out I have a lot of grass. Halfway through, a neighbor introduced himself and admired the new Briggs and Stratton engine. Hoo-Hoo! We discussed basements, landscaping and sump pumps, a topic with which I am all too familiar. He told me he had pitbulls and a 21 year old son with a shiny red convertible. I told him I would try to keep my 17 year old daughter away from both. At some point during the two hours of cutting and trimming, I started to wonder just why it was I wanted so much lawn. Oh, yeah, raised beds. I’d show you a picture of the beautifully cut backyard with the perfectly straight diagonal mower lines but I was too tired to take a picture. Speaking of mower widths, I found myself in the aisle of the local big box store questioning two employees, “Do 2 inches really make that much difference?”. Funny looks. The kid came with me this time. She made herself busy raking the flower beds and bagging leaves. I took her to a wallpaper store and she picked out some samples. We pulled up the carpets on the second floor and stairs. Why do people pick ugly carpets, she asked. Good question. Beauty is in the eyes of the beholder or the previous owners couldn’t see too good. Obama and the Democrats are less than useless. Film at eleven. I picked up on this at Eschaton but it needs to go viral. That’s right. ONE lawmaker showed up. ONE. This is how much American politicians care about the millions of people thrown out of work by the reckless gambling of our financial class. This is how much consideration hundreds of thousands of unemployed scientists get from their government. The whole lot of them need to lose their own jobs and see how it feels to make ends meet on their dwindling savings and part time work. There are no words that adequately describe how disgusted I am. Revealing, Sickening or Scarily Incompetent? Someone hacked the AP Twitter account today and tweeted that the White House was bombed and Obama was badly injured. The stock market took a dive. 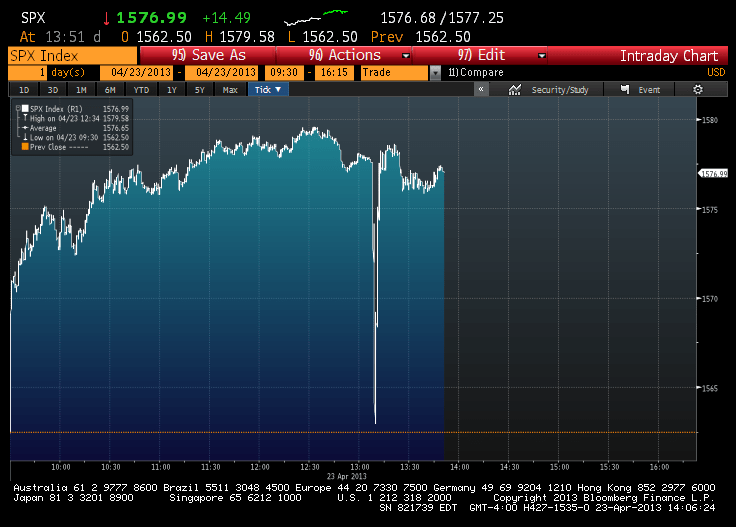 In a matter of minutes, the market plunged almost 100 points. That’s not a precedent I would have liked to have set. Maybe next time, they’ll hack Reuters, MSNBC, CNN, Al Jazeera and the State Department. The people who run the economy should be sacked. …I am in the process of relocating. As some of you may recall, I bought a house in Pennsylvania. 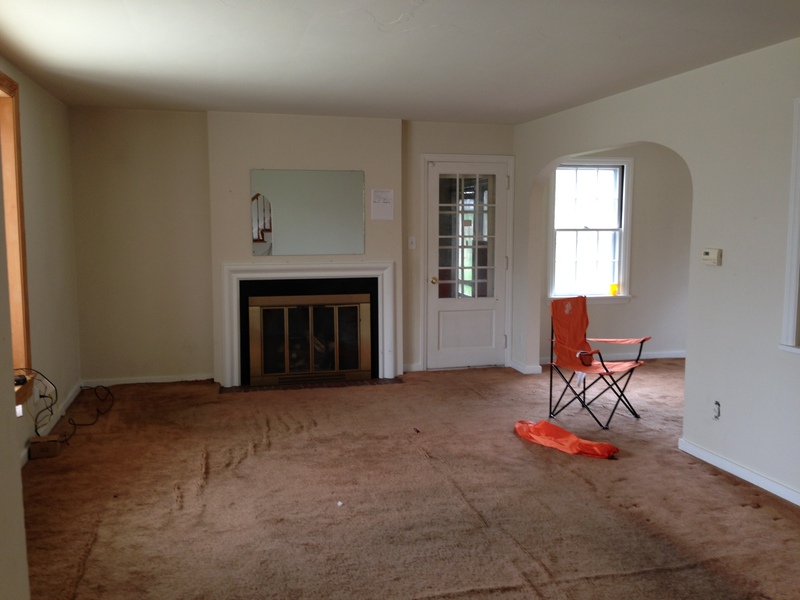 It was a foreclosed property and I got it at a steep discount. This past week, I started getting it ready for occupancy. It needs a bit of work, especially in the basement where there is a water issue that needs to be addressed. There are also some landscaping issues and code violations that need to be fixed so we won’t be moving in for awhile yet. That drop dead gorgeous hardwood floor has been lovingly protected for 60 years from dogs and kids by successive applications of dingy beige carpet. I couldn’t afford a floor as beautiful as this. It’s a rich dark brown with a lovely patina. It just needs a good cleaning but not too much refinishing action. Even the seams between the planks are perfect. Buying this house was a bit like going to a basket auction and not knowing exactly what I was getting. 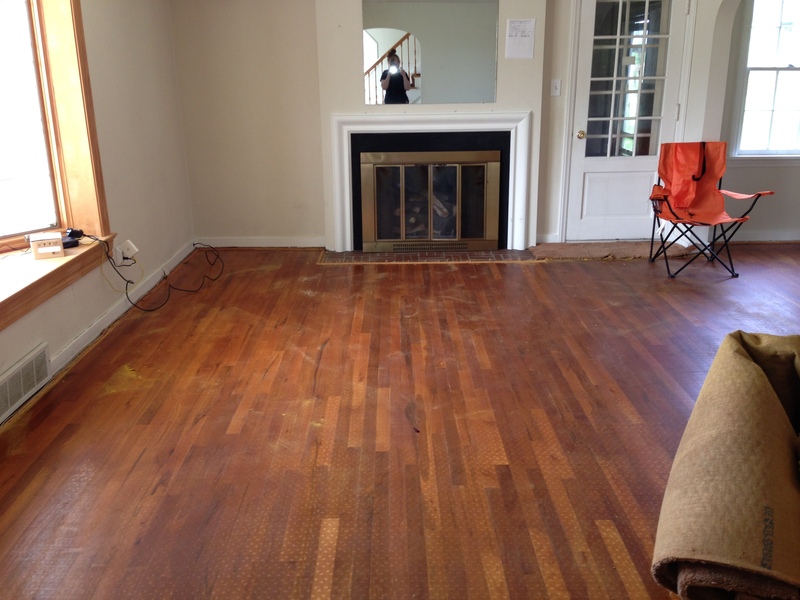 The floors were a nice surprise and they run throughout the house. Combine that with the arched doorways and built-in hutches and niches and I would say I scored a bahgain. It’s in lockdown mode right now while the terrorist suspects are being rounded up. There are a lot of R&D facilities in Cambridge. Derek Lowe of In the Pipeline who works there just checked in with an update. This is not the first time that R&D people were associated by location with terrorism activities. In 2001, the pharma labs in central NJ had visits from the FBI when the anthrax letters made their way through the Princeton, Trenton and Rocky Hill post offices. I’m sure it’s just an unhappy coincidence.